Plus Buy a bag of the 30 lb Lightening Lime ($20) and receive $5 back. 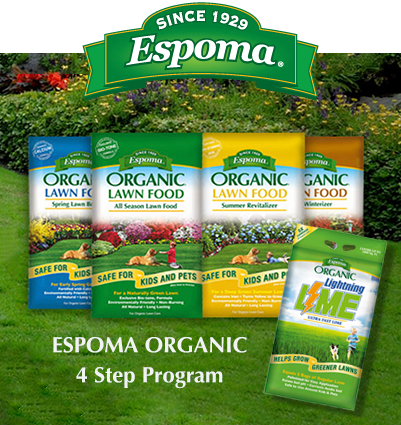 All Espoma Organic Lawn Products are specifically formulated to optimize the health of the lawn, and provide 2.5 times more slow release nitrogen (SRN) than conventional lawn programs. All Espoma Organic Lawn Products are specifically formulated to optimize the health of the lawn, and provide 2.5 times more slow release nitrogen (SRN) than a conventional lawn program. 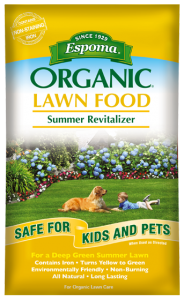 Sumer Revitalizer also contains Bio-tone Microbes that help make nutrients more available to your lawn. These microbes will help promote faster greening, deeper roots, and improved soil structure. All Espoma Organic Lawn Products are specifically formulated to optimize the health of the lawn, and provide 2.5 times more slow release nitrogen (SRN) than a conventional lawn program. 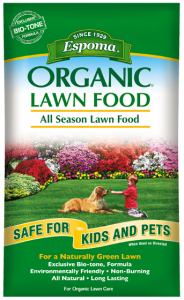 All Season Lawn Food also contains Bio-tone Microbes that help make nutrients more available to your lawn. These microbes will help promote faster greening, deeper roots, and improved soil structure. 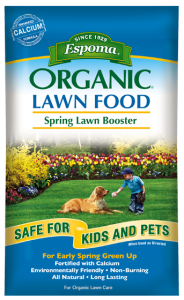 Supplies long lasting Nitrogen, an essential nutrient that helps to promote a thicker lawn and vigorous growth. It is also fortified with Potassium, a nutrient that helps the lawn recover from summer drought conditions, enhances Winter hardiness and helps promote a better Spring greening the following season. Holly-Tone fertilizer is for acid-loving plants, such as hollies, azaleas, camellias, evergreens, hydrangeas, dogwoods, blueberries, strawberries and rhododendrons. It is rich in natural organics and used and recommended by Professionals for decades. Holly-tone also contains Bio-tone®, our proprietary blend of beneficial microbes. Bio-tone biologically enhances our plant fertilizer to ensure superior plant growth. All natural plant fertilizer for acid loving plants. • For acid-loving plants, such as hollies, azaleas, camellias, evergreens, dogwoods and rhododendrons. 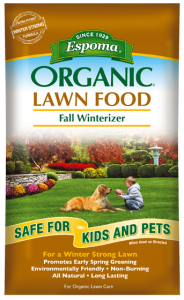 • Mix organic, granular fertilizer with soil to encourage healthy growth of acid loving plants. • Enhanced with Bio-tone microbes. • Slow-release fertilizer for extended feeding. We have a vast selection of Organic Plant Food for all your gardening needs.